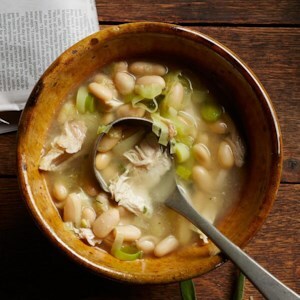 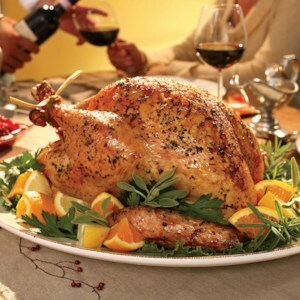 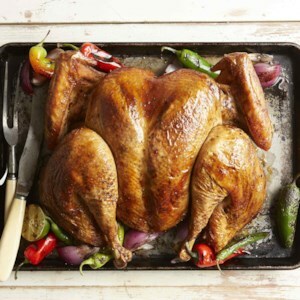 Healthy turkey recipes for an easy weeknight meal. 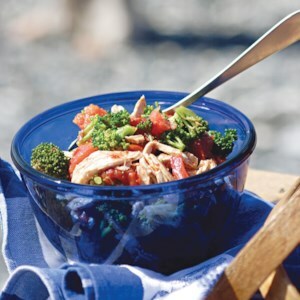 This simple but substantial main-course salad gets its goodness from smoky skillet-blackened tomatoes and a dressing prepared right in the pan--maximizing all the flavor from the tomatoes. 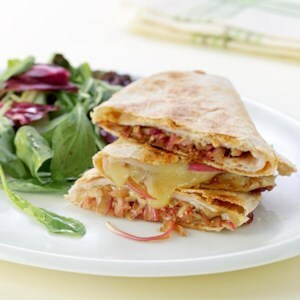 Not your traditional quesadilla, these feature deli turkey and Cheddar cheese, along with onions quickly marinated in balsamic vinegar. 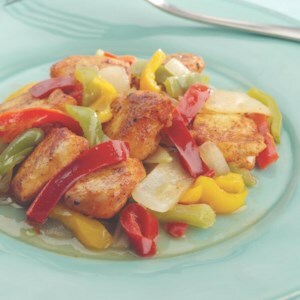 Serve with sauteed vegetables or a tossed salad for a quick meal. 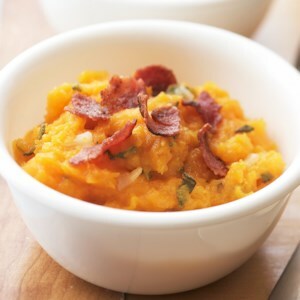 The delicious combination of sweet, tart and savory flavors Makes a simple dish the star of a weeknight meal. 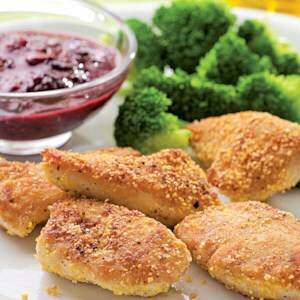 Serve with whole-wheat couscous, to soak up the tasty sauce. 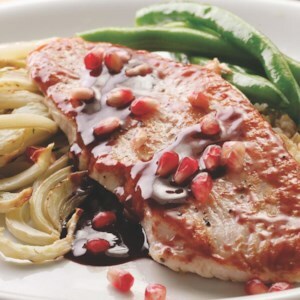 Pair turkey cutlets with roasted fennel and a rich pomegranate pan sauce for a simple yet elegant dish. 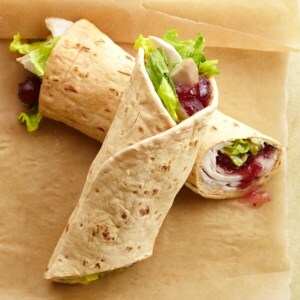 Garnish with jewel-like fresh pomegranate seeds if available--they are in season from September through January. 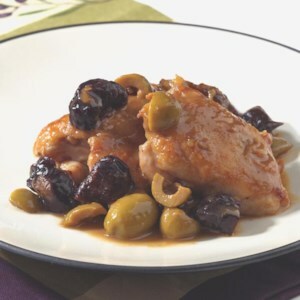 Turkey scallopini (thinner and smaller than cutlets) will also work in this recipe, but will need to be cooked in batches. 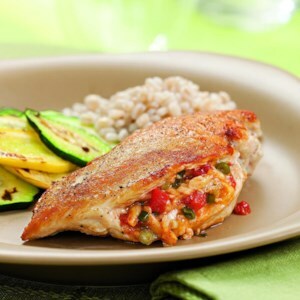 Make it a meal: Nutty-tasting bulgur is delicious with this. 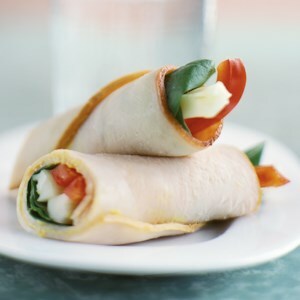 For a bit of protein between meals and a satisfying crunch, roll up a single carrot stick in a slice of turkey lunchmeat. 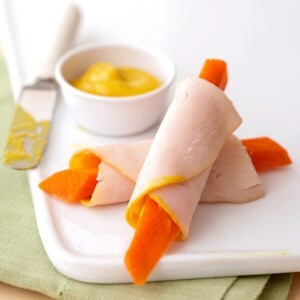 A typical 3-inch carrot stick has only 3 calories and less than 1 gram of carb. 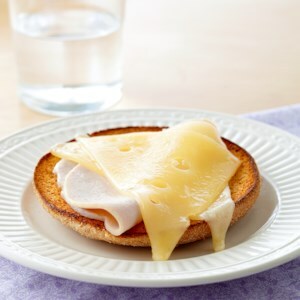 For an afternoon pick-me-up, try this open-face bagel melt that combines whole grains and protein to keep you going. 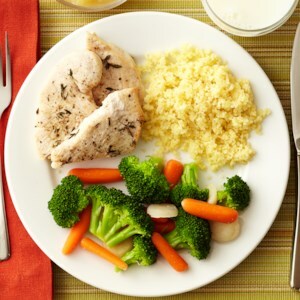 Turkey and couscous come together beautifully when paired with a vegetable medley. 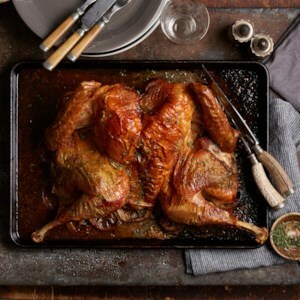 To give this recipe an Indian twist, season the turkey breast with curry powder or an Indian Spice Rub before grilling or roasting, and toss pine nuts into the cooked couscous. 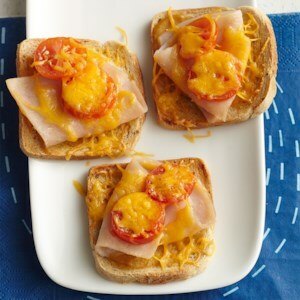 This satisfyingly melty low-carb snack is packed with protein--and flavor. 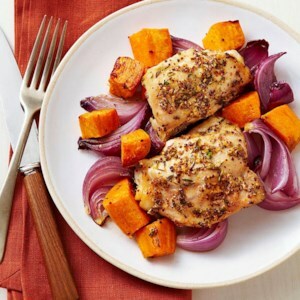 Caramelized sweet potatoes and red onion are the bed for chicken thighs that cook up fast in a very hot oven--perfect for a quick healthy chicken dinner. 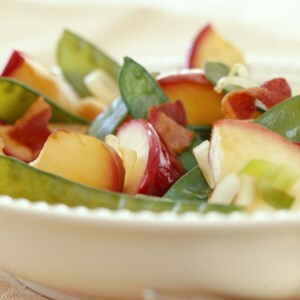 Serve with a fall salad of mixed greens, sliced apples and blue cheese. 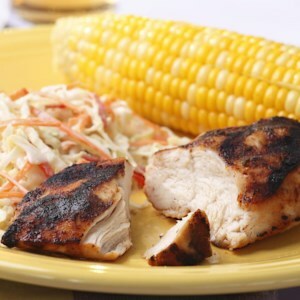 This sweet and savory rub for grilled chicken relies on ingredients you most likely have on hand already--brown sugar, dry mustard and onion powder--making it a quick recipe for a night when you're not sure what you're making for dinner.